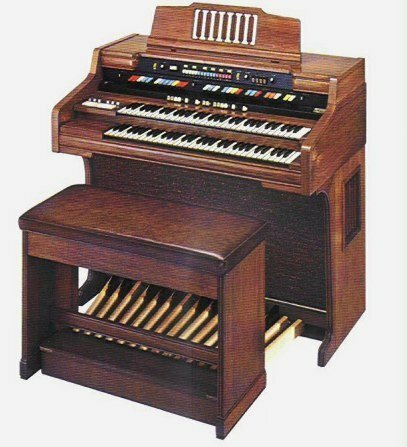 I got this organ really cheap in the fall of 2009. It is solid state, but does a pretty good imitation of an older tonewheel organ like a B3. 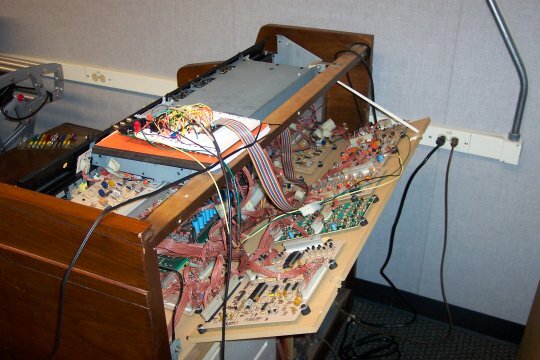 It has a little built-in Leslie speaker and all kinds of weird gadgets like an analog drum machine (which sounds a little like a TR-808), Symphonic Strings (which sound kind of like a Roland VP-330's strings), automatic chording, Fascinating Fingers II (an arpeggiator), etc. I am designing the boards myself and programming a PIC 16F877 chip to generate the MIDI. The key contacts on the Commodore output about -20V when the key is pressed. I wanted to use CD4067 16-to-1 analog multiplexer chips, which cannot handle a voltage range wider than about 20 volts, to scan the keys into the PIC. So I am using voltage dividers to reduce each key signal to about -2V before it goes through the multiplexers. The multiplexer chips are running on +/- 5V power supplies generated by 7805 and 7905 voltage regulators from the Commodore's +/- 24V supplies. 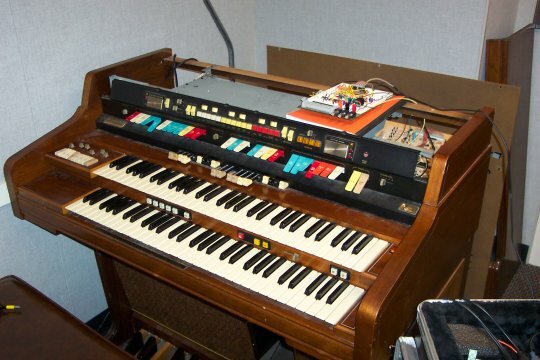 Here is what it sounds like when the organ is driving a synth in Reaktor: (1.4 MB mp3). The Hammond is doing the drawbar sound, strings, arpeggiator (sorry, FASCINATING FINGERS II), and drum machine. Reaktor is being driven by the top manual and is doing the analog-synth-like notes.